Toyota has completely revamped the Avalon for 2019. 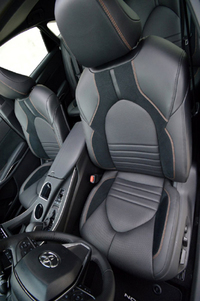 Until now, their top line luxury car put a premium on ride comfort. Styling was nondescript. Performance was competent but unexciting. Model differentiation was negligible. And price was always on the high end for a sedan based on the Camry platform. The newest iteration of the Avalon addresses many of the issues that previously dampened buyer enthusiasm. One look at its scintillating shape will have you wondering "What's That?" 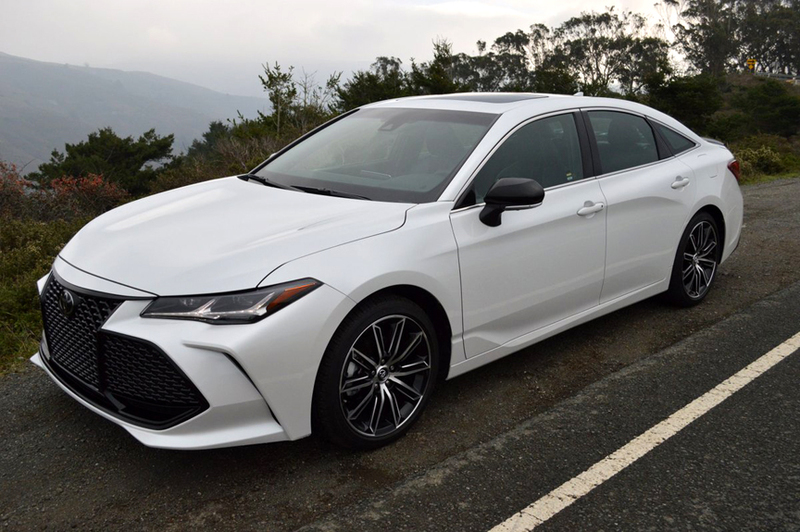 The clean lined design of the 2019 Avalon resurrects this model from the visual discard pile. Toyota stylists, heeding the credo that less is more, have crafted a refreshing new shape unencumbered by ornamentation. We tested the Touring version, which retails for $42,200. An optional $1,150 "Advanced Safety Package" consisting of "Intelligent Clearance Sonar, Bird's Eye View Camera with Perimeter Scan, and Rear Cross Traffic Alert" brought the bottom line to $44,665. The Bird's Eye View Camera performs a 360 degree scan of the Avalon and its immediate surroundings when the car is stationary. It's a neat feat, and worth the package tariff all by itself. Toyota has expanded the Avalon model range to appeal to four distinct buyer groups. The XLE base model appeals to those seeking a bargain buy-in. XSE and Limited versions will assuage buyers seeking more luxury. Our Touring model represents a first in the Avalon line because it's designed to appeal primarily to sports minded owners. To that end, the Touring Avalon offers sports tuned front and rear suspension controlled by the driver through a mode switch designated "Adaptive Variable Suspension." This Touring specialty allows you to toggle among the following options: Eco, Custom, Sport and Sport+. 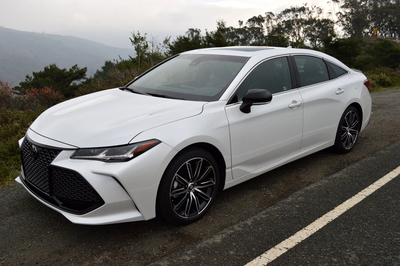 Anyone who has reluctantly coaxed an older generation Avalon through tight turns will find the idea of a Sport+ setting for an Avalon to be absolutely revolutionary. So it's time to disabuse yourself of the notion that the Avalon is a ride for sedate old folks. Maybe Toyota needs to hatch a new Oldsmobile punch line like "This isn't your father's Avalon anymore." I was astounded at how well the Touring version, when adjusted to Sport+, handled back road duty. Helping in this regard was the revamped V6 which now offers 33hp more than before. Bristling with sophisticated engineering, this 3.5 liter engine delivers 301hp to the front wheels through a "Direct Shift" 8-speed automatic gearbox. One of the true tests of a sporting automatic is whether it will retain your chosen gear selection without automatically up-shifting without authorization. When you place the Direct Shift ECTI gearbox into manual mode gate, and utilize the wheel mounted paddles to shift, the Avalon Touring never upshifts until you command it to do so. In Sport+ mode, this sizeable sedan is rewarding to drive, with excellent acceleration on tap from the V6, and a gearbox that follows your every command. Surprisingly, there's even an exhaust system which plays through the speakers of the Premium Audio system. Toyota calls this theatrical feature, "Engine Sound Enhance with Active Noise Control." In Sport+ mode, the Touring's lacy black, machine finished 19 inch alloy rims, carrying 235/40R19 Michelin MXM4 tires, work the road surface with precision. There's never a stumble as this tenacious wheel and tire combo seeks grip. Only the tightest turns occasion so much as a chirp. After a half hour of back road bashing you will be mumbling to yourself, "Is this really an Avalon?" 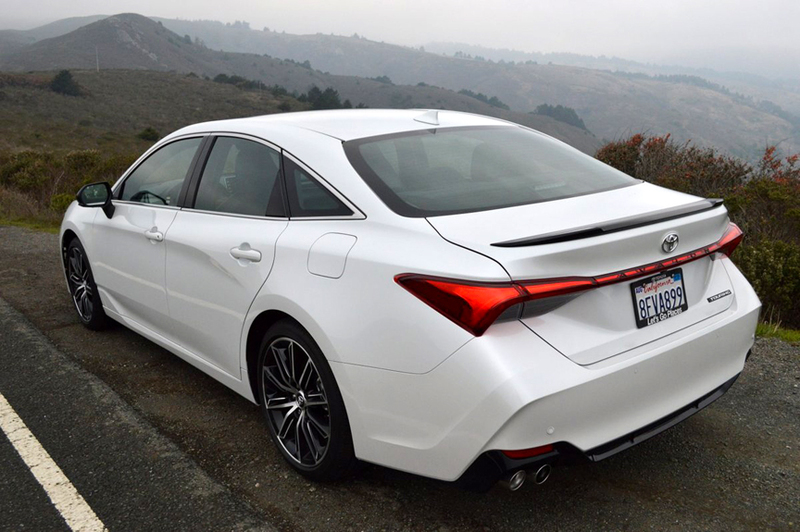 In fact, you can drive this sportingly configured addition to the model range just as sedately as any older Avalon. Just dial down the performance hubbub by dialing up the Eco setting. Or customize the system to provide your desired response level. Touring will comply with a pliable ride, pillow soft steering, and sluggish throttle feedback. The interior, luxuriously appointed like foregoing Avalon parlors, will sooth you with its plush seating, and soft touch surfaces. Faux carbon fiber trim adds a jaunty air to the mix. You'll also appreciate the 3rd generation telematics of the Entune 3.0 system, which allows you to link your smart phone for navigation purposes. Though Entune has previously accepted only Android Auto, the Avalon now connects with Apple CarPlay. In the conservative Avalon world, the Touring model is something of a revolutionary break through. It retains the best virtues of the brand while adding enough driving virtue to make this once stodgy sedan appeal to a completely new customer base. The Most In-Depth Independent Toyota Vehicle Consumer Research - Anywhere!